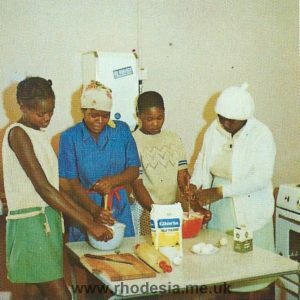 A remarkable transformation in life for Rhodesia’s urban Africans. 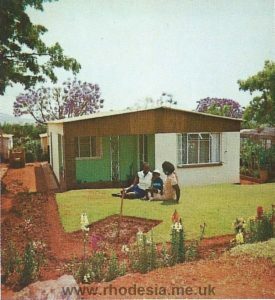 Rhodesia’s burgeoning African townships provide the basic requirements for Rhodesia’s expanding urban African population. Yet, despite the efforts of civil administrators, more and more tribesmen are seeking the bright city lights and adding to what the experts call the “influx control” problem. That aside, what has been achieved is remarkable. 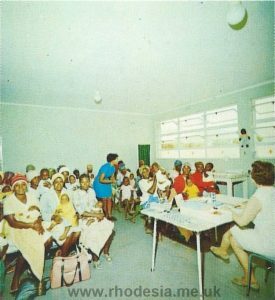 For instance, more than 311 000 Africans live in ten townships around Salisbury (1973), and they live in modest but clean, airy, simple housing-housing which has refuse removal, sewerage disposal, street lighting, paved roads, piped water, electricity, entertainment and sporting centres as standard services. In the early days, much of the accommodation was designed for the itinerant labourer who returned to his tribal home after a short stay in the city. The family lived in the village. His own housing needs were simple. Today, many urban Africans are sophisticated. Many more are regarded as skilled and valued employees. And, the majority of them spend most of their working life in the urban environment. 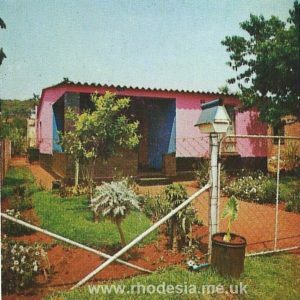 Because home, to many, no longer meant the thatched kraal, urban home­ ownership schemes became increasingly popular, while for unmarried people, the authorities followed the trend elsewhere; that of providing single accommodation in modern flat-like hostels. These African suburbs are largely self-contained. There are clinics and child­care centres, commercial and business areas, hotels, beer-gardens and bottle stores, shops and markets, social clubs for all ages and fine sports and recreational centres. And there is schooling to match all this development. About 39 000 primary and secondary school pupils attend 44 schools in the capital’s African townships. 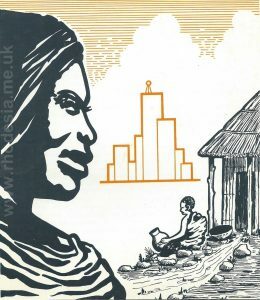 As in other parts of Africa, the pattern of life for Rhodesia’s emergent tribesman is constantly changing; where he embraces the dubious benefits of the 20th century in towns and cities his life takes on a new dimension. It has been going on a long time. 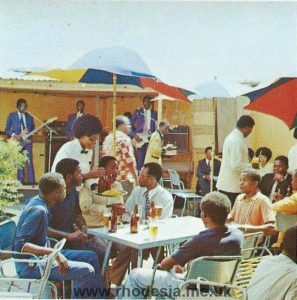 It has created a large, settled middle-class urban African society. 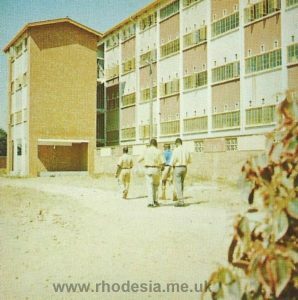 Free from the squalor of slums, remote from the drabness of modern apartment ­block living that exist elsewhere, Rhodesia’s urban African can accept and even welcome his new environment. The challenge lies in the future. Housing shortages have become endemic. 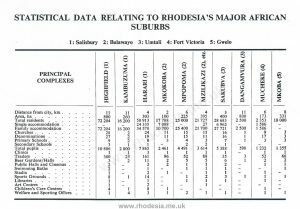 Can Rhodesia ever provide sufficient housing for its urban masses? 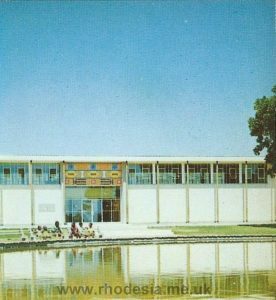 General hospitals and full maternity facilities are within reach of all peri-urban residential areas throughout Rhodesia. Infant mortality in these suburbs has dropped to 20 per thousand. In many other parts of the world the figure is as high as 300 per thousand. Creches and children’s care centres play an important role in areas housing working mothers. Extensive immunization campaigns against tuberculosis, poliomyelitis, smallpox, whooping cough, diphtheria, and measles have brought these diseases under control. Building activity in the New Environment has not been restricted to living accommodation. In the suburbs mentioned in this article, 120 churches serve in some instances as many as 27 religious denominations. Four major Art centres and libraries cater for the artistic and studious. 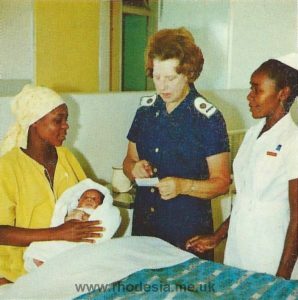 There are several distinct tribal groups of Africans within Rhodesia. The two major tribal groups are the AmaNdebele and the Mashona, the latter being the most numerous. 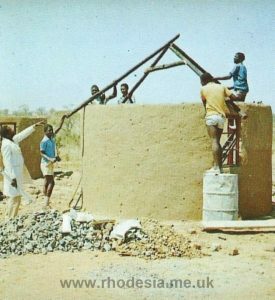 Historically speaking the negroid or Bantu-speaking peoples of Rhodesia are fairly recent arrivals to the area, coming from the north in successive waves that overwhelmed the original inhabitants-the Bushmen. The warrior AmaNdebele are an offshoot of the warlike AmaZulu of Natal and Zululand. Following a quarrel with Tshaka, king of the AmaZulu, one of his subordinates named Mzilikazi fled from the wrath of the king and-many years later-settled in the south-west of Rhodesia. Their language Ndebele is allied to Zulu. 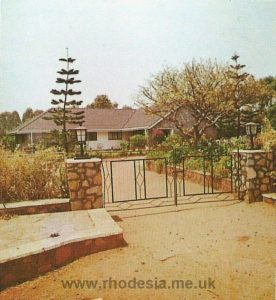 Cattle were of paramount importance to the AmaNdebele, and their ferocious raiding in what is contemporary Rhodesia was directed against the Mashona. From these people they captured cattle, grain, and women and children. Until Rhodesia was civilized at the close of the last century, the AmaNdebele raids were a regular phenomenon. A combination of inter-tribal warfare, disease, and malnutrition was responsible for the estimated African population being a mere half-million at the time of European occupation. Today it is over five-and-a-half million. Unlike the AmaNdebele, the largely agrarian Mashona people are composed of a number of different sub-tribes. Perhaps the best known group is the VaZezuru of northern Mashonaland, followed by the VaKaranga of southern Mashonaland, the VaManyika of the east, and the Makorekore in the north and north-east. Confusing as these names may seem to the uninitiated, they are still significant to the tribes themselves and their administrators and teachers. Additional groups that can closely be placed under the heading Mashona are the AmaKalanga of the south-west, the VaNdau, the VaRozwi and the BaVenda. Several of these tribes have regional affinities that predate today’s political boundaries. The VaNdau peoples extend over the frontier with Portuguese East Africa, as do the VaManyika and the BaVenda who are an offshoot of a tribe with the same name in the Northern Transvaal. 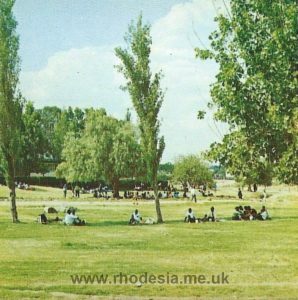 Though many native dialects are spoken in Rhodesia, Shona is the main language. Ndebele is generally restricted to the west and midlands. Naturally there are vast differences between the click language of the non-Bantu Bushman and the Shona language – although Ndebele contains a number of the click-sounds found so fascinating by visitors. Although a polyglot and very limited ‘pidgin’ language – known by a variety of names – was widely spoken between whites and Africans, or groups having radical language differences, this has now largely given way to the use of English as the common tongue. 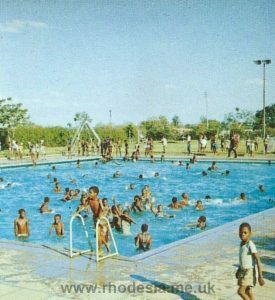 As a more sophisticated urban community develops, so the usage of English increases, serving the inter-tribal structure of Rhodesian African suburbia. Nowhere is it more true than in Africa to say that “old customs die hard”. Tribal affinities, ties, and customs-in the majority of instances wholly admirable – continue to play a significant role in the lives of those who live in the cities. The emergence of a fairly novel tolerance, resulting from sound administration, enables the new urbanites to co-exist in a manner that would have been impossible less than a century ago. Seven swimming pools, and the same number of sporting stadia, together with 32 sports grounds, provide for a keen interest in sport displayed by the new urban class. and the young man leaving home can find economical accommodation. Convivial relaxation is provided by 39 beer-gardens and beer-halls, although many families prefer to entertain in their own homes. This is especially true of successful businessmen, now creating their own middle class and sometimes building the most luxurious houses. … and a daydream about the house that’s a practical proposition for the ambitious and successful. Family accommodation in the peri-urban districts houses between 1½ thousand people in smaller centres to well over 82 000 in the biggest existing complex. Increasing interest is shown in more sophisticated cooking methods, domestic appliances, and gardening. … and might be followed by a quiet spell in a garden of one’s own. The following details were correct at the time of going to press (1973) but are subject to change and usually upward trends. The numerous social clubs, cultural and entertainment activities almost defy representation in tabular form. There are playgrounds, creches, centres for handicapped children, night schools – and an increasingly popular family planning organization. Municipal authorities work closely with Government Social Welfare Officers. Visitors can see the latest developments for themselves on tours with guides and administrative personnel. The document reproduced above was originally issued by the Ministry of Information in 1973.